Refractive cataract surgery is a customized cataract procedure now offered at Vance Thompson Vision in Bozeman, MT. Our board-certified ophthalmologists Drs. Thompson, Berdahl, Greenwood, Swan and Baartman were among the first providers to offer refractive cataract surgery in this region of the United States, and they also participated in its clinical development. In this advanced approach to cataract care, patients are able to benefit from the most advanced diagnostic technologies available today. These combined with a comprehensive variety of advanced implants to fit their visual goal and lifestyle after cataract surgery and the same technologies used to make LASIK surgery as predictable as possible create an opportunity for as much spectacle freedom possible. From new ways to measure significant visual changes before cataract surgery to the ability to monitor each micro-detail during cataract surgery, patients should be certain to understand all of their options prior to surgery being performed. For more information on the difference quality technology can make in cataract surgery click here to review our 21 Point Checklist for Cataract Surgery. "Amazing team , Bozeman is lucky to have Dr. Swan and his team. Extremely thorough, detailed and it’s obvious the level of expertise and technology is second to none." "The staff was amazing from the first phone call to surgery day. If you are considering laser eye surgery you don't need to look further: this is world class technology and customer service right in Bozeman. I had PRK on 1/24/19 with Dr. Swan which was a painless, simple and quick procedure (despite my fears of it). I had -5.25 with astigmatism in both eyes and could tell the vision improvement the same day, drove 5 days later and one week out had major improvement in vision. My aftercare doctor has mentioned how smooth my eyes are and how well they are healing due to Dr Swan's technique. [Tips for PRK: plan to spend 2-3 days relaxing in a dark room (audio books and black out curtains a must! ), pain happens after surgery so take the Tylenol immediately to keep up on pain management, and keep up on the eyes drops]"
"The entire Vance Thompson team is purely wonderful! Dr. Swan, Bri, Susan, Kim and the entire crew make each patient feel comfortable, welcome, and well cared for at every interaction! I can't recommend these guys enough!!!" "Kind and competent best describes them. I felt cared for and thT my surgical concerns became their concerns." "Amazing company and staff! Highly recommend!" When considering cataract surgery, it is important to understand your lens implant options, so you can choose a lens that best matches your lifestyle. Monofocal lens implants focus at one main point and that point can be set at distance, intermediate or near. This implant allows for the sharpest possible vision at its set point - usually distance. Because the monofocal lens is typically set to focus at distance, reading glasses or bifocals are usually necessary to give patients the best possible near vision. Our standard monofocal lenses are the most advanced in their category, designed for distance and improving image quality. The Tecnis lens, for example, is a Wavefront-adjusted monofocal implant. Unlike other monofocal lenses, Wavefront-adjusted lenses offer improved functional vision, which not only helps you see at a distance more clearly but also improves night-time image quality and contrast sensitivity. Presbyopia, the Greek word for "aging eye," is a condition that causes near vision to fade with age, making it difficult to see things up-close. Presbyopia is the most prevalent eye condition in America, affecting most people after the age of 40 and everyone by their early 50s. While some lenses are used to see clearly at a distance after cataract surgery, multifocal and accommodating lenses are specially designed to combat the effects of presbyopia for clear distance vision plus a full range of intermediate and near vision, reducing the need for corrective lenses or even reading glasses. Multifocal implants, like the ReStor and Tecnis multifocal lenses allow focusing to occur at multiple distances by using light that enters in different parts of the eye. These advanced presbyopic lenses have the potential to reduce or eliminate patients' need for corrective lenses altogether. Are you interested in being free of reading glasses or bifocals? Until recently, this was not an option, but now with the introduction of the Acrysof IQ ReSTOR IOL, the possibility of being free of reading glasses has arrived! This advanced lens is FDA approved and is giving patients clear vision at all distances—near, intermediate, and far! 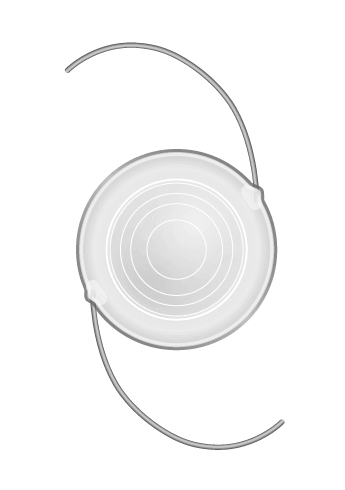 The Acrysof IQ ReSTOR IOL is typically implanted during cataract surgery to replace the natural lens, which has become clouded by cataracts. This new lens can provide enhanced visual quality and the full range of vision, giving patients an increased independence from reading glasses and bifocals. The ReSTOR IOL can also be implanted during an elective refractive lens exchange procedure for those who may not be a candidate for other vision correction procedures, such as laser vision correction. If you have trouble seeing at a distance as well as up close, or you require bifocals, this IOL might be a better vision solution for you! Extended Depth of Focus (EDOF) lenses, like the Tecnis Symfony, are designed to provide a continuous range of vision for distance, intermediate, near, and everything in between. By combining a unique diffractive pattern with achromatic technology, the Tecnis Symfony IOL delivers excellent visual acuity over a continuous range of distances and provides high contrast sensitivity for greater clarity. Like multifocal lenses, EDOF lenses can be used to replace the cloudy lens natural lens in cataract surgery or as an elective replacement lens after a refractive lensectomy. Even though vision will be greatly improved, the EDOF lenses may require some patients to use glasses for extremely small detail. When considering cataract surgery, it is important to go to a center that offers several implant options and can discuss which options best match your lifestyle. At Vance Thompson Vision, we offer a full menu of lens implant options for distance vision and near vision functioning. Another important thing to consider is that centers ability to fine tune your vision after your surgery. The same laser and refractive surgery options that help people see clearly at a distance are available for cataract surgery candidates who want to optimize the effectiveness of their lens implant selection. If an advanced cataract surgery is an inevitable part of your vision treatment, you should call Vance Thompson Vision for an appointment for refractive cataract surgery. Schedule your private consultation at our Bozeman, MT office today with Dr. Swan. We want to help you see the difference it will make in your life without cataracts.